Suggestion provided by: CALA Certified Instructor, Suzanne.. If you inquire at the stores, they’ll know the best products. In my experience, I’ve used various products—one huge boom box that was water resistant but eventually failed after years of use (depends on number classes, moisture in air, must be cleaned regularly)—one pool was salt water and over the summer months (when we weren’t there) we found a salt residue on our equipment in the fall when we returned (so I covered my boom box during subsequent summers)—I’ve stored smaller boom boxes in a closed container for protection, stored in locked shed, and this worked— The BEST means of playing music for me now is my Bose ($300) and ipod ($250) which is portable for all my classes (no need to plug it in, CDs get scratched and can no longer be used, so it’s best to download CDs, make playlists on ipod—can delete songs you don't like, on each CD). The biggest challenge is finding a boom box that plays an ipod (some instructors use these, and in my opinion, this is the ONLY way to go), but others use CDs, so I need a boom box at each of my 7 pools that plays both, and this is sometimes hard to find. You can also purchase a connector which you can plug into a boom box and your ipod (if it only plays CDs). With Sony closing its doors, you might also find some sales right now. Hope this is helpful. 1. Question: regarding anaerobic training in the water: What are the work:rest ratio times? I know for land, depending it can be 1:3 or 1:4. I was reviewing the deep water vertical manual and it says in the back 1:3 however I wasn't sure with venous return and water properties if the ratios changed as compared to land. 1. Answer: I have been promoting 1:6 as a ratio. I hope that helps. 2. Question: Wow. So, to confirm, if the participants are working anaerobically for 30 sec they rest 3mins. I was thinking a shorter rest time with venous return etc. There are several possible reasons for hamstring cramps during a quadriceps stretch. I will list some causes and cautions below, do let me know what works for your participants, after you suggest the following options. Firstly, I am assuming you are doing the standing quad stretch, during the stretch portion at the end of the class. (a) If the water temperature is on the ‘cool’ side (less than 84° F), thermal conductivity may cause the hamstring muscle to lose heat. As the quads are stretched, the hamstrings are activated. If the hamstrings are too cold, then there is a strong possibility that a cramp will result. I suggest integrating dynamic stretching of the quad muscles, rather than a static standing stretch. This will keep the quad and the hamstring muscles warm and may avoid the cramping. (b) If the participants have not generated enough heat in their skeletal muscles during the ‘workout’ phase of the class, then the hamstring muscles may not be warm enough, when the standing quad stretch is performed. I re-iterate the strategy above (a) and also suggest that you consider educating the two participants (possibly before or after the class) about how to elevate their body temperature by exercising at a higher effort level. You can demonstrate options for them to make the workout harder to generate more kinetic energy resulting in more body heat. * This is assuming the participants are healthy enough to exercise at an appropriate level of intensity to generate heat. (c) Check to be sure that the participants are in a relaxed state of mind, body and spirit during the stretch. This can be facilitated my your tone and volume of voice, and the music you use. Remind them to deep breathe, and especially to relax their fingers and hands, toes and feet. From time to time, participants try to grip the floor with their toes and the bottom of their feet. This action might facilitate a chain of tension through the feet, the calves and then into the hamstring muscles. (d) If your participants are having a hard time maintaining their balance during the standing quad stretch, this might cause the hamstring muscles to activate involuntarily. Encourage participants to hold on to the wall or use one hand/arm under water in a sculling action to maintain balance and to generate heat. (e) Add a dynamic vertical repeater quad kick/ham curl movement for 16 – 32 repetitions to warm up the muscle pair, then to the standing quad stretch. Repeat on the other leg. CALA Certified Leader: Dawn ... posed the following question: I am working with a senior who had a very serious car accident about 15 years ago, she was not expected to live, but proved them wrong. Her humerus was badly broken and a plate was put in her arm (humerus area). When she does any water work involving her arms she says her arm will ache, (this arm is also weak), she will stop working and walk around the pool. I am wondering if she should have a sling on her arm and just work the other arm for approximately 1 week. I am also thinking about a sling while she is at home or give that arm support with a pillow when she is sitting. I gave her some exercises for home--shoulder rolls forward & backwards, shoulder shrugs, hugs, and keeping her shoulders in neutral position. I guess that the plate is creating some of the problems. Should I keep the exercises going for this arm to strengthen the muscles, or wait for about a week? I hope I have explained clearly enough. Response: I think it might be wise for this person to consult with their physician to see why there is so much pain in the arm area, 15 years post surgery. I think encouraging the client to listen to her body and stop exercising the affected limb if there is persistent pain, is a good idea. Perhaps she also needs to see a physio. I can recommend Farhan Dhalla in the Health Centre, at the Fitness Institute Clinic ( 2235 Sheppard Ave East, Toronto, Ontario, M2J 5B5) Phone: 416-492-761. Sorry to be so vague, but it sounds like she needs treatment by a physio who can prescribe specific exercises. I have forwarded your email to Connie J. and to Elizabeth Fox to see if they have other thoughts on your query (below). You might also want to join the ATRI e-list (www.atri.org ) . This is a fee service, where you can post your questions to the wide world and get responses from the wide world! I agree with Charlene. I also think your client should be assessed by a competent physio who has a lot of experience with shoulder issues. From there, she will have a list of recommendations for movements to be encouraged and avoided. Until she can have that done, she might try keeping the arm fairly still during cardio, in order to keep herself active. Gentle ROM of her arm within her comfortable range during MSE / stretch, might be OK. If she has developed neuropathic pain (ie: the structures have healed, but her body is on red alert to any movement in her affected limb) she may need some counseling about that, to help develop strategies that will help reduce her pain. She won't know whether it is neuropathic pain or not, until she is assessed. Good luck to her and you. Cheers, Connie Jasinskas, CALA Master Trainer, M. Sc. So I think Charlene's advice is wise. A physio or a similar health care provider, might be the best source to recommend exercising through her pain if that is really what is needed. Otherwise she should do what she can and aim for very small incremental progressions each week or more likely every other week. As for the sling, I really can't think of a situation where I would suggest a sling in the water (other than maybe a hemiplegic shoulder, on occasion) Certainly if the arm is aching - supporting it while sitting makes good sense. I would agree that a physio consult is likely in order, perhaps even to clarify goals - is improving the pain a reasonable goal or really is education needed about better managing the pain and this is where the pool comes in?? Certainly you can improve strength and function, which may or may not change the chronic pain. Cardiovascular exercise is also an important component of chronic pain management. Improved overall cardiovascular conditioning can also improve overall function, which still enhances quality of life, although, the arm pain may not have changed. Understanding the scope of Aquafitness enables everyone to experience the true value of exercising in the water. Through the valued skills and knowledge of CALA members and contacts, answers to your questions are available. Questions and answers are posted so that others may share in the information provided. Your name will not be included with the question and answer unless you give permission. How to establish and build programs. Answer provided by Charlene Kopansky, Founder and President of CALA Inc. If you want to participate in Water Running, it is best to actually attend a water running class, that is taught by a CALA Certified Instructor in the Water Running Specialty. This is an important question to ask any facility and/ or instructor. The person at the front desk of the facilty may or may not know the answer... You can also ask for the fitness director or aquatics director. Ask for specific CALA Certification in Water Running, rather than in Group Aquafitness. I believe that if more consumers asked for this specialty, it will become more prevalent as an option for training and then more classes would be offered! At the moment the number of class offerings in Water Running in Toronto are limited. I have been trying to get the concept of Water Running launched in Toronto and have had limited success. The key is to have people teaching the class who actually have the CALA education and training, in the Specialty and have read about running on land and transfered that knowledge to water. CALA also offers ongoing conferences and workshops that feature new ideas for water running geared to instructors and interested participants. I have attached a copy of our most recent brochure. We also have an excellent resource that you can purchase. It details the ins and outs of water running and is a great supplement to a personal training session. It is a CALA Resource. I would suggest you try a Water Running Class. I know of two in the City. Another option is to hire a trainer to coach you on Water Running so that you can do this on your own at a pool near you. This would involved 1 - 3 personal training sessions and is well worth while. CALA Certified Leader: Dawn ... posed the following question: I am working with a senior who had a very serious car accident about 15 years ago, she was not expected to live, but proved them wrong. Her humerus was badly broken and a plate was put in her arm(humerus area). When she does any water work involving her arms she says her arm will ache,(this arm is also weak), she will stop working and walk around the pool. I am wondering if she should have a sling on her arm and just work the other arm for approximately 1 week. I am also thinking about a sling while she is at home or give that arm support with a pillow when she is sitting. I gave her some exercises for home--shoulder rolls forward & backwards, shoulder shrugs, hugs, and keeping her shoulders in neutral position. I guess that the plate is creating some of the problems. Should I keep the exercises going for this arm to strengthen the muscles, or wait for about a week? I hope I have explained clearly enough. You might also want to join the ATRI e-list (www.atri.org) . This is a fee service, where you can post your questions to the wide world and get responses from the wide world! It was my understanding that we can encourage participants without health limitations to work at their maximum range of motion. Specifically suspended ski, referring to shoulder and hip extension. (cuing reaching to the back wall). Today, a participant questioned why I use this cue. She has been corrected by other instructors that the hip extension in particular, should only go to 45 degrees, and that she is reaching too far back. I explained that in my view if the other instructor had concerns it may have to do with ability to keep the body core stable, and not twisting, or that the larger ROM may cause discomfort to some participants if they are going past what is safe for them individually, or maybe that reaching too far back would compromise the power posture and create low back hyperextension. I just want to confirm that I did not misunderstand the instructions and that it is safe for participants to work to their comfortable ROM. keeping in mind that the resistance be kept in a safe range as well as speed. I just wanted to make sure my response was appropriate. I try to make sure that if instructors give different information to a client that I try to explain my point of view without contradicting the other instructor. Thanks in advance for clarification with this matter. You are absolutely correct. While maintaining the power posture, with a stabilized core and all the other goodies you mentioned, keeping in mind zone of comfort, we are recommending that participants find their comfortable range of motion and work within it. Generally speaking the population has underdeveloped the hip extension phase of movement, thus injuries happen with slips and falls or during activities that require good flexibility at the hip joint. Hope that answers your question. I am assuming you were talking about a regular class! Carpal Tunnel Syndrome: I have someone with Carpal Tunnel Syndrome in my aquafitness class, is there anything I should not have her do in the water? Her doctor said not to do any punching motions. * Do not alter prescriptions assigned to your client by the medical community (without communication between yourself and the person who prescribed the treatment, with the client's permission for such communication). Her MD has said, "no punching motions", and that is to be respected. * Do not prescribe: I would ask the client what she has been told she CAN do / SHOULD do to improve her condition. If she has no idea, perhaps she should see a physiotherapist / osteopath / rheumatologist / chiropractor in order to determine what her best course of action is. 1. Focus on functional posture throughout all movements / while stabilizing: scapular set; proper cervical alignment with ears over shoulders; neutral pelvis, stabilized by transverse abdominals, pelvic floor and multifidus. 2. Have her maintain a functional, neutral, pain free position of her wrists throughout all gross-motor activities. Just maintaining her wrists well-aligned while doing other activities in the water, she will receive a mild training stimulus to the wrist stabilizers. If she has trouble doing this, she may need the wrists braced while exercising in the water (something she can investigate with her medical team). NOTE: Specific exercises for the wrists should be prescribed by her medical team. I want to know if there is a difference between Aqua Running and Aquajogging. Is Aqua Running more specific? I know that "to jog" and "to run" are very different, but, in the water, these differences may seem superfluous. When I co-wrote the resource and training manual for this specialty course, the team of writers decided that both joggers and runners would benefit from the training effects of exercising in water. To avoid minimizing the market, we decided to include both 'names' in the manual. When training in deep water, zero impact, the biomechanics of running and jogging are very similar. There is no ground reaction force when running in deep water hence the actual running form is modified to suit the aquatic environment. The good news is that the specificity of training remains high, from water to land. If on the other hand, one is training in chest or shoulder deep water, there is impact involved and this affects the biomechanics of water running and aqua jogging. Get into deep water, with an appropriate flotation belt and try simulating the jogging action and the running action. How does it feel? What changes did you make to the biomechanics of your movements? Try the same experiment in chest deep water. Try running at a race pace, what happens to the landing phase of your movement? I have a degree in Kinesiology. I have never heard of double positive muscle activation. Could you explain more about it? Thanks for reading the articles on our web site. I also have a degree – Honours Biological Science with my major in Human Kinetics and a degree in Education. The double positive muscle activation refers to the following: When immersed to shoulder depth: performing knee extension and flexion: the quads will activate concentrically during the knee extension phase; the hamstrings will activate concentrically during the knee flexion. This is due to the fact that the 'location of the load changes' - water is all around the body, you are constantly pushing and pulling it (multidirectional resistance). The 'nickname' for concentric muscle action is positive muscle activation. The nickname for eccentric is negative muscle action. The lack of soreness is because of the balanced work: double concentric or double positive. While the quads are working concentrically, on knee extension, the hams are releasing - getting a fresh blood supply - so the lack of eccentric is the same as saying double concentric or double positive. Just a different way of saying the same thing. During our CALA Foundation Course, we do discuss the lack of eccentric muscle work during most movements in water. No, it still doesn't make any sense, are you talking cardio component or muscular component? I thought that in order to actually gain muscle strength, you must have a concentric and eccentric phase. I also do not understand the reference to a “release of muscle tension”. A “Double positive” muscle activation isn’t necessarily the technical terminology for what happens, but it beats saying “concentric-concentric”. B Double positive or “concentric-concentric” muscle activation means that eccentric muscle work is reduced or absent, and therefore, DOMS is reduced or absent. C There is a "release of muscle tension" when using the opposing muscle group. Refer to the work of Dr. Herman Kabat (mid 1950s), based on the work of Dr. Charles Sherrington. Sherrington’s Laws of muscle activation ‘Reciprocal Innervation / Inhibition”, states, ”a reflex loop mediated by the muscle spindle cell …causes one muscle to relax (be inhibited from contracting) when the opposing muscle (the antagonist) contracts. This allows movement to occur around a joint. For instance, when the quadriceps muscle contracts, the hamstring is reciprocally inhibited, thereby allowing the knee to straighten”. Source: Facilitated Stretching, R. E. McAtee, HK press 1993. If the antagonist did NOT relax when the agonist activated to cause movement, we would be constantly tearing antagonistic muscles, or be locked immobile in isometric cramps. Re: Your statement: To actually gain muscle strength, you MUST have a concentric AND eccentric phase. This is not true, otherwise, gains in strength could not occur in the water, or with hydraulically braked exercise equipment. There has been some controversy at our pool about hand position during a breast stroke. One person is saying that the thumbs can't be down during the pull back, they must be up, or it is not a healthy action for the shoulder. If this is so, we must have a lot of lane swimmers hurting their shoulders! Either move is possible for the shoulder joint, and I am not aware of any danger inherent in a 'thumbs down' breast stroke pull-back. However, in this action, the shoulder joint is medially (internally) rotated. Many people are habitually in this alignment due to working on computers and other forward- focused manual activities. It is often wise to counteract this habitual postural misalignment during physical training activities. If possible, to try to restore more functional alignment to the shoulder joints and shoulder girdle. What can be done, when participants concentrate more on conversation than they do on working out? “I have found one solution to participants talking during class: I have told them to find a place where they have a lot of room to manoeuver. Once they know the movements, I tell them to close their eyes and concentrate on that movement and on their stability. I have found that this makes participants work harder because they are more aware of when they start to get lazy. Every so often, they can open their eyes to make sure they are not getting too close to each other and/or the edges of the pool. This technique really does make a difference. I have tried it and it works! Not everyone is closing their eyes when I ask them to. I think that with time they may get to like the challenge it offers. It may be fear of the unknown that is holding some of my participants back. My reason for using this technique for myself was to experience the session the way a blind person would. I could not believe how much harder I worked and how aware I was of every movement. Doing this exercise allows the mind to rest and as a result, tension seems to leave the body. Is the supine (floating) position permissible in the third trimester of pregnancy, or should it be avoided? I know that on land, it should be avoided; in water is there any risk involved? In the water, you don’t have gravity acting on the abdomen, compressing the inferior vena cava (this is the problem on land). Therefore supine is not a concern in the water, with respect to circulation. Doing a lot of supine work, however, can cause neck strain: I do little of it— other than the occasional stretch, or “snow angels” for range of motion at the hip and shoulder. In deep water, if a pregnant participant cannot tolerate the aquatic belt, what other options can I offer her? I know that one option would be to ride a noodle; could a participant also use foam dumbbells under each arm—limiting the time to 10 minutes in order to prevent strain of the shoulder girdle joint? Is this a viable option, or would it be better to use the pool wall? My preference would be to 'ride the noodle' if the belt is too uncomfortable. I know some women who wear the belt above the belly, and some who wear it below. The participants can ‘play’ with those options and make the best choice for themselves. Sometimes, if a client has enough body fat, she may pass the float test (float in a vertical “T” position, arms out to the sides and still, legs straight down and still). If the participant does not sink to below her chin and neck, she will not need a belt to work in the deep end. The use of dumbbells under the arms is not recommended: it impedes circulation to the hands, and can put pressure on the delicate plexus of nerves in the arm pit. If none of the above options work, and a belt is too uncomfortable, I would suggest exercising in shoulder to chest depth water until after the pregnancy is over. I have a pregnant woman in one of my water running classes and her doctor was saying to her that her maximum heart rate would be lower because she is pregnant. Do you know how to calculate maximum heart rate for a pregnant participant? Could you give me some idea of how hard she should be working? Access the wisdom of Dr. James F. Clapp, Exercising Through Your Pregnancy, HK Publishers, 1998, p 27: “To assume you can use a standard target heart rate formula... as a satisfactory guide for assessing the safety, health effects, and training effects of any exercise regimen during pregnancy seems unwise. During pregnancy, the exercise heart rate has value only when it is continuously monitored, interpreted in the context of pregnancy, and compared with serial measures that reflect exercise intensity and physiological effect (how hard it feels, oxygen consumption, fetal heart rate response, fatigue, and so on)... In summary, no matter what her age or what stage she's at in pregnancy, how a pregnant woman feels before, during, and after a workout appears to be a better index of her health, safety, and quality of the workout than her heart rate response." From my experience, monitoring Heart Rate in the water is next to impossible unless the subject is wearing a waterproof heart rate monitor. Perceived exertion at a "somewhat hard" level is where she wants to be. As long as she has a healthy, uncomplicated pregnancy and is cool and comfortable, she can safely go up to 'hard' intervals, according to Dr. Clapp. I have several participants who are recovering from Breast Cancer treatment that involved varying degrees of tissue removal. The mobility in the upper body is affected, especially in the shoulder, upper back, arm and chest regions. What exercises would you recommend? Any and all CALA arm movements are great, since they provide a variety of joint angles and forces for the arms and shoulder girdle. Emphasize a 'scapular-set' for all upper body exercise: roll the shoulders up then back, then down, and fix the scapulae (shoulder blades) low and centred toward the mid back. This is the strongest, most functional position for upper body work. The thing that needs to be emphasized for Breast Cancer clients is FULL range of motion of the shoulder joint, so the stretch section at the end of class could be increased if water temperature allows. Do a number of slow stretches overhead, interspersed with shoulder girdle adduction and abduction (round the shoulders & rotate the humerus inward, then pull the shoulder blades together, open the chest, and rotate the humerus outward by pointing the thumbs back). They could also be given some extra stretches to be done in the shower. An excellent one is to stand with your hip next to a wall (your feet parallel to the wall), and with a straight arm, trace a circle on the wall from your hip at the front ... all the way overhead...to your hip at the back. Standing close to the wall is more advanced, standing farther from the wall is a gentler stretch. What kind of quad stretch do you recommend for people with knee problems? They cannot really bend the knee too much, let alone grab the ankle. • then, bring that same heel up toward the surface of the water. No need to hang on to the heel. Note: Buoyancy will help bring the back leg up toward the surface, stretching the hip flexors and quadriceps muscles of the back leg. • scull with hands and arms to maintain vertical balance. After ~10 - 15 seconds, split the stretch further (open the legs). Repeat this 2 - 3X before changing sides. Again, no need to hang on to the back foot. The knee is not in danger of any inappropriate forces. What does (I am not sure if I remember the term properly) diastasis recti mean? This is a separation of the rectus abdominis muscles during pregnancy. The connective tissue running between the two halves of the rectus muscles softens in response to the hormones of pregnancy (relaxin). If the abdomen is profoundly stretched, the two halves of the rectus muscle will tend to take the shortest route when the rectus abdominis muscles are activated. This means they will tend to move laterally to travel a straight line from the sternum to the pubis,and not have to work over the large expanse of the abdomen. The split can be made worse by doing aggressive abdominal work (ie: crunches on land) once the split has begun. Aqua natal exercise does not place the same forces on the rectus muscles, providing aggressive tucking actions are not performed. Therefore, it is a useful way for women who are experiencing diastasis recti to maintain core strength. In the CALA Basics Manual, Chapter 6, page 40. It says that lactic acid build up is not involved in DOMS. What is the reason for DOMS? Is it the microscopic muscle tears from repeated eccentric contractions only? My understanding is that the exact cause of DOMS isn't fully understood/proven, but we do know that it isn't lactic acid, because that is metabolized during recovery. The “muscle tear” theory seems one of the most likely, and it includes evidence that there is cellular swelling (lymph dealing with the injured tissues)... resulting in that “tight feeling” one gets after vigorous exercise. What is the result of lactic acid build up in the event that active recovery was not done after vigorous exercise? My understanding is that the lactic acid gets metabolized anyway. Active recovery enhances circulation and the recovery process at a cellular level. Active recovery is more likely to enhance performance when it is not at the end of a workout, per se, but used as a rest interval, with more work to follow. Jennifer Oman asked a question about including stretching during the warm up phase of a class. Stretching at the beginning of a class, or after a warm up is not currently recommended on land. Add the thermal conductivity of water and you have an even stronger case against pausing to stretch. A pause to stretch would allow the muscles which have just been warmed up to get cold. Then trying to get the muscles to stretch seems like a juxtaposition. We all know the relationship between cold muscle tissue and the ability to stretch. Also, the energy level which is built during the warm up to motivate and focus the participants may slip if a stretch portion is added. Include 1/2 tempo* and, or 1/4 tempo full range of motion movements in the warm up along with tempo movements. During the 1/2 and 1/4 tempo, dynamic stretching can be integrated. For example, large full range of motion walking at 1/4 tempo, with a cue to keep the heel on the pool bottom for as long as possible ( within the music) before starting the next step. Encourage toe-ball-heel landing and you will have designed a dynamic stretch of the gastrocnemius and soleus muscle in the calf region. *Tempo guidelines are based on music between 118 and 126 beats per minute. A Tidal Wave - Volume I Music Tape, 90 minutes of the correct tempo, suitable for Aquafitness, step, gentle aerobics and muscle conditioning is available for purchase through CALA. Dear My-Linh: My recommendation is to keep the floor at a level where the majority of the class is armpit depth and all arm moves work well for them. Give the 5 shorter people a deep water belt. With the flotation belt they can perform the movements suspended and water depth is no longer an issue. However, you will have to offer choices for deep and chest deep movements, when leading. As you know the ‘horse’ and ‘pendulum’ moves do not work in deep water, so you will have to instruct the people who are suspended to do other moves which work in deep water like cross country ski or jumping jack. If you do not have aqua belts, then the participants can order some from H2Owear. I have found that many participants appreciate the opportunity to have their own flotation belt and feel proud to bring it to class. I hope this helps you. I like the question and believe it is a common problem with pool depth and varying heights of participants. Good luck! Detailed Description Feel secure and relaxed for your deep water workout. Custom-molded, non-chafing flotation belt is designed for comfort and freedom of movement. Adjusts to fit waist sizes 28" to 40". CECs can be earned depending on the course and workshop. How do I know what is currently offered.? Refer to the Upcoming for a list of current offerings. If you do not see the course or workshop that you are looking for, contact CALA to discuss your requirements and the possibility of you hosting the session. Who do I speak to if I want to host a workshop or course.? Contact CALA's Host Affiliate Manager to discuss hosting opportunities. Do I have to be a member to attend a workshop? No, workshops are open to everyone. The membership price is less than the non-membership price. You may want to consider becoming a CALA member so that you can benefit from the reduced rates. Can I also get credits from other fitness organizations by attending a CALA courses? NSFLLA (Nova Scotia Fitness Leaders and Lifestyle Association), etc. Aquatic Exercise Association (AEA) etc. Why is the CALA "Exclusively Water" Conference offered? This international educational event provides an opportunity to bring together fitness and other health care professionals with an interest in utilizing water as a tool for training and/or healing the body, mind and spirit. 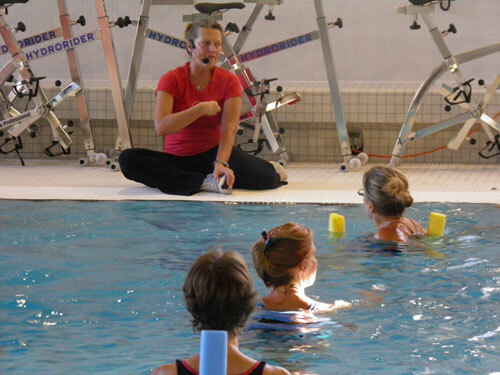 A variety of diverse workshops and classes are offered featuring general and unique forms of aquafitness, aquatic rehabilitation and specialty water exercise. Workshops vary in format and topic. Each conference includes areas of interest for participants, new and experienced leaders, coaches, lifeguards, aquatic facility supervisors and managers. Workshop Formats: Workshops range in length from 1.5 to 5 hours in length. During a 2 hour workshop, the following agendas are utilized: Pool - refers to chest deep, deep or a combination of chest deep and deep water sessions. What is a class theme? A class is a wonderful opportunity to exercise with like-minded people who enjoy the water. There are no expectations of fitness level or ability. Class formats are generally 45 to 60 minutes in length and are conducted in chest deep, deep or a combination of chest deep and deep water. Participants of any age, size, gender and fitness level are invited to jump in the water and have some fun, or take notes on deck while observing the creative ideas shared by presenters. The conference is an open forum for participants, new and experienced leaders, personal trainers, lifeguards, pool and fitness centre supervisors and managers and land based instructors interested in adding water to their repertoire of expertise. Do I have to be fit to register for the conference? Fitness level and experience are of no consequence. An interest in learning and a love of water are two ingredients which will make your conference experience fulfilling. If I am an Older Adult, or a Teenager, is this conference appropriate for me? CALA has offered 11 successful conferences and several regional conferences, since 1993, all of which have welcomed and provided valuable learning opportunities for people of varying ages and levels of experience. The oldest conference participant was 78 years young and the youngest participant was 16 years old (In 1998, at the 7th Annual conference, hosted by the University of Guelph, a group of 10 children lead the Grand Finale Conference master class. The children ranged in aged from 5 to 14 years. The class participants went wild, hooting and hollering to encourage the young leaders and to show their appreciation for a wonderful experience and a job well done). If I attend a CALA conference, can I earn Continuing Education Credits (CECs)? Yes, you will earn one CALA CEC per hour of workshop or class that you attend. If you attend 12 hours of sessions, you will earn 12 CALA CECs. Can I also get credits from other fitness organizations by attending a CALA conference? Are CECs useful to me if I have not completed certification with CALA? Yes, you can earn Continuing Education Credits (CECs) at the CALA conference (and other educational events) and bank them for future use, when you do decide to complete CALA certification. What else is offered at the CALA conference in addition to the educational sessions? A Trade Show is open during the event. This show highlights industry related vendors who offer their products at discounted rates. The vendors include companies that sell music, educational resources, clothing, nutritional supplies, beauty products, vitamins, and other aquatic and fitness related products. CALA always has an exciting booth which sells a variety of CALA merchandise at reduced rates (including aqua flotation belts, aqua matt, replacement straps, T- shirts, RYKA 2 Aquatic fitness shoes, water bottles, music etc). If I am interested in being a presenter, how do I apply? We welcome new and experienced presenters. Contact CALA and request a presenter application. Email is the best method: cala@interlog.com . If you have any questions, include them in the email, or call the head office at 1-888-751-9823. I would like to volunteer at an upcoming CALA conference. How do I apply to be a volunteer? We welcome hard working, committed volunteers to assist our team. Contact CALA, to receive a Conference Volunteer Application package. What type of volunteer positions are available? CALA needs volunteers before, during and after the event. Some of the volunteer duties include: assembling the participants packages, working the registration desk, taking attendance at each session, providing direction and assistance at the venue, calling members, processing conference registrations, reminding members and non-members of the event, securing exhibitors for the trade show, making arrangements for guest speakers, pre-arranging, setting up and serving food and beverages, taking pictures, gathering and collating feedback, ensuring all rooms and pool areas are properly set up for presenters and assisting presenters as required during their session, cleaning up the conference venue when needed - and many more. It is fun and rewarding, believe me! CALA has had some of the same volunteers for 11 years running. Are there opportunities to network with other instructors at a CALA conference? Yes, you will meet many new people at the event. Presenters interact with delegates before and after the sessions. You will feel like you have become a part of a big, happy, open and warm family. You can meet instructors from across Canada and from other countries. Many delegates continue to network in the months following the conference and look forward to meeting one another each year. The circle of friendship grows larger and larger with each event. WHEN and WHERE is the next CALA conference? CALA will be finalizing the 2004 "Exclusively Water" Conference dates and location in the next few months. Stay tuned to the web page. As soon as these details are confirmed, they will be added to this site. CALA plans to return to the Etobicoke Olympium, but they are undergoing massive renovations which may preclude our booking. We are also researching locations for upcoming REGIONAL conferences - all over Canada. CALA could be coming to your city! Are any of the sessions filmed? Yes, CALA does film many of the sessions. Participants are told the session will be filmed and used for promotion and sale. Participants have the choice to be in the film or not. They can move their position to ensure they will not be filmed. Is it possible to change sessions on the day of the conference? While it is not promoted or encouraged, yes, if the session is not full, participants may change sessions by going to the registration desk on site or contacting CALA before the event. To get credit for a session you must be accounted for on the attendance list. If for some reason you are removed from the first session but not added to the replacement session, you would not receive credit for attending the replacement session. It is your responsibility to make sure you are on the correct attendance list. The conference sounds excellent, when can I sign up? Contact CALA and we will indicate on your record that you would like to register. When the conference brochure arrives at your doorstep, be sure to fill it out immediately and send in your registration. This will ensure you get your first choices for each time block in the conference. The Canadian Aquafitness Leaders Alliance Inc. (CALA) is an international, educational organization with a mandate to provide high quality training, certification and access to current information for its members and others in the active living community. Our courses are research based and provide a strong network for aqua fitness leaders, aquatic post rehabilitation specialists, personal trainers and coaches. CALA promotes professionalism and excellence through thoughtful integration of the mind, body and spirit. What are the benefits of getting certified as a CALA Leader? What are the steps to become CALA Certified to teach Group Aqua fitness? What are the other specialties and programs that CALA offers? Workshops: Over 100 topics including: Liquid Aqua Muscle, Aqua Deep Choreography, Aqua Cycle, Beyond Abs and more. CALA TeleClasses –Gain knowledge and network with other leaders from the comfort of your own home! CALA Events are eligible for Continuing Education Credits (CEC’s) / Professional Development Credits (PDC’s) / Renewal Credits with a variety organizations including LSS, CanFitPro, OFC, AFLCA, NSFA, SPRA, BCRPA, YM/YWCA.. See the website www.calainc.org for full list. Where can I find out about upcoming courses in my area? Is it easy for my facility to HOST A CALA course for instructors or a MASTER CLASS for participants? Absolutely! It is convenient, easy to organize and facilities have the opportunity to earn $revenue$ and subsidize staff registrations by hosting a CALA event. To receive a full information package, email CALA or call us today. Should I consider a CALA Membership and how much are the courses? There are many benefits of having a CALA Individual or Corporate Membership. Discounted rates on CALA events, merchandise, educational materials, early registrations, newsletters, job postings, access to members-only section (coming soon!) on the CALA website. Course fees are competitive for the of training hours and high quality of the programs; plus you have the option to pay in installment plans - ask us for details! What type of equipment, music and videos do you sell? How has CALA training helped rejuvenate Aqua Fit programs. was so impressed with the CALA approach, that I have spent the last year working towards becoming a trainer for the CALA program. I was fortunate to meet and be able to work with Shelagh Noonan over the last year and she is an awesome trainer. The two of us joke as we are the Canadian Shanghi Noon trainers "east meets west". I worked with the nay sayers, I was told many times that the participants didn't want to change, and yes there were a few who didn't like it. However the majority loved the changes. The CALA program is solid, no participant could change my mind that the old way was better. It has taken four years to evolve. I only started aqua tai chi this past fall, but they the participants were ready for an additional challenge. I have been forwarded your email regarding an interested in bringing CALA to your facility. We have been offering CALA aquafitness classes at our facility for the past 7+ years. Our classes average 20-30 people each time. The quality of training our instructors have received from CALA is the reason these classes are so popular. Our customers rave that our classes are fun, energetic and effective. We have had customers from out of town who say they can tell we offer CALA Quality by the way we teach and that it is by far the best class they've done. In addition to our 7 aquafitness classes per week we also offer 3 Aquajogging classes (we had to add another class due to popular demand). This is also a CALA program that has been very successful for us. We average 30 people per class ranging in ages and fitness abilities as well as good representation of both male and female. Many of our Aquajogging participants have said it's the best work out they've ever had! It's important to note that Whitehorse is a community of around 20,000 people so we're pretty proud of the numbers we get. From a revenue stand point with mostly adult admissions- CALA training is well worth it. I think your community will be pleasantly surprised with how good Aquafit can be. Your instructors will enjoy the courses taught by CALA (Shelagh and Charlene are fantastic!) and will be motivated to lead great classes. If you have any other questions, feel free to ask. Best of luck with your programming. How often do I have to renew my registration? You must renew your CALA certification annually. To certify you must have earned 8 CECs and pay an administration fee. All CALA workshops, courses and conferences are posted immediately on the CALA website on the Upcoming page. If you don't see what you are looking for, please contact CALA. We are welcome new host facilities. If I accumulate more than the minimum number of renewal credits, may I use my extra credits for the next registration period? Yes, CALA banks your CECs. You can use them towards future recertification. How do I apply for recertification credits from a non-CALA event? Forward a copy of the workshop outline, length of the workshop and biography of the presenter to the CALA office for review. We will send you a confirmation of credit approval (receipts will not be accepted). An administration fee will be applied. What documentation is required as proof that I attended an approved workshop? All organizers of CALA-approved workshops must issue a certificate of attendance indicating the number of renewal credits. Receipts will not be accepted. When do I send my recertification and membership renewal registration information into the CALA office? CALA will issue a reminder approximately 6 weeks before your membership and recertification are due along with the applicable fees and requirements. Once payment is received you will will receive a membership and recertification renewal confirmation. Please allow 2-3 weeks for this process. Both the membership and recertification are renewed annually on the same anniversary date. What if I can't complete my recertification requirements before my expiry date? CALA keeps a record of all your earned and used CECs. You can take them anytime during the year. Once you have enough CECs you can stop earning them for that year. Any additional CECs earned during that year will be applied to the next period. What's in the Wavelink newsletter? The Wavelink contains CALA-offered workshops and courses, plus a list of stores of interest and industry related, lists of participants in recent workshops and course, new certification, tips and hints and questions and answer. How do I apply to become a CALA Trainer? Contact the CALA office and refer to the Become A Trainer page on the site. Someone from CALA will contact you directly to discuss upcoming Trainer training sessions. There are many sources of fitness music: Power Productions, Burntrax, Muscle Mixes and Dynamix, to name a few. Many music companies offer discounts at fitness conferences. Or, you can purchase fitness tapes over the phone or on the Internet. Contact individual companies to receive their catalogues. What happens if someone gets hurt in my class or during a training session? Follow your CPR/First Aid training and facility procedures, document what happened. What happens to my registration when I move? Contact CALA to make sure their records are current and correct. You CALA certification is valid throughout Canada and Internationally. If you leave the country, you should contact CALA to determine if your membership should be converted to an international membership. Why do I need to maintain my membership? Although membership with CALA is not mandatory to work in all fitness facilities, it is always a benefit to receive professional recognition. What level of CPR and First Aid is required? CALA does not require you to have CPR and First Aid training but your place of employment may have this as a condition of employment. Can I add specialty designations, such as Water Running or Kick Box? CALA offers a number of specialty courses that you can become certified in. Check out the specialty courses under Training and Events. One factor that needs to be taken into consideration is the target audience. If your clientele is older, or unfit, the water may need to be warmer: 85 to 86 degrees F.
If the clientele is very fit the water could be between 83 and 85 degrees F.
If this is gentle ROM class for therapeutic purposes, he water needs to be warmer: 88 to 92 degrees F.
Is a class broken down into sections? Yes, to ensure a total body workout the instructor will lead you through 4 phases during your session, those being warm up, cardio, muscle strength and endurance and stretch. Each phase has a purpose and your instructor will ask you to do each exercise in a specific way depending on the phase. You should always follow your instructors leads while working at your own level. Phase 1 - Warm-up is used to do just that. It warms up the body and muscles, lubricates the joint and starts the kick starts the heart. Phase 3 - Muscle Strength and Endurance. Your leader will take you through a number of exercises that will help build your muscles and increase their endurance. These exercises may include repeated movement with one leg and then repeated on the other leg. These exercises may be repeated 4 times with a break in between to allow the muscle(s) to relax. An example is repeated hamstring curls. You may do 4 sets of 15 seconds on each leg and then 1 minute of a variety of swivels. Phase 4 - Stretch - Your leader will lead you through stretches and holds that will ensure the full body is stretched before you leave the water. It is important that these stretches be done at the end of a session. Do I have to be fit to participate in Aquafitness? Fitness level and experience are of no consequence. An interest in learning and a love of water are two ingredients which will make your Aquafitness experience fulfilling. You should always first check with your doctor before commencing any exercise. Depending on certain medical conditions you may need to alter some movements to ensure your safety (these include but not exclusive to: natal, hip replacement, arthritis). What are the benefits of Aquafitness? CALA has provided an extensive list of benefits on the Aquafitness page. Aquafitness allows you to do similar to land exercises without the impact that may injure your joints. Do you ever do water running in chest depth as an alternative? The pool in this hotel is chest depth so good for aqua but does not have any deep water. I would like to do 2 sessions together and I am thinking about an alternative for the 2nd session. Any suggestions? What do you do in Canada? It could be mothers and toddlers. Yes, I have done water running at chest depth, you have to cue a 'toe ball heel' landing if you are running at speed, or you need to integrate half tempo moves with deliberate 'toe ball heel' landings to ensure the calf (gastrocnemius/soleus) muscles do not tighten up. Add some walking as well in the warm up and cool down, which is a 'heel, ball toe' rolling landing. Get in the water yourself and see what you feel works with regards to running in chest deep water. Although deep is best for water running, because of the zero impact, chest deep can work really well, if carefully designed. You will not need tethers or flotation belts. Mothers and toddlers is super fun too. I could do a workshop on that topic the next time I am in Wales. You might want to put those two topics forward for Fitness Wales... 'chest deep water running' and 'mothers and toddlers'. I would love to do those workshops. Would you take a person with Osteoporosis in the deep, deep suspended or would the pressure be too much on their fragile sternum, spine and rib-cage? Would you stay chest or shoulder deep on a noodle instead? Would you have light contact exercises to build bone density? First of all, osteoarthritis and osteoporosis are two different conditions.. OA involves arthritis in the bones, caused by wear and tea. Osteoporosis on the other hand, is a decrease in bone density to a level considered to be a medical condition. People with advanced osteoporosis are prone to spontaneous fractures and susceptible to injury of the bone when doing any impact activities, or quick movements. Yes, I would take people with osteoporosis into deep water. I would design exercises to increase muscle and bone density. I would offer a variety of exercise intensities (primarily using surface area manipulations) and ensure the individual listens to their own body and chooses the level of intensity appropriate to their condition and stage of osteoporosis. I would avoid any quick changes in direction or exercise and simply change one aspect of a movement at a time. Pam wrote: I am a FM sufferer and would like more information on your FibroMoves. I want to try it and ask the college pool trainer if they will import this program in their schedule. My name is Kathy and currently I am the only FibroMoves instructor. The program was originally created by McMaster University (Hamilton, Canada) and the Kitchener YWCA however they discontinued it because of funding issues. I was a participant in the program at that time and found that it was the only thing that helped me to deal with my fibromyalgia. Since I couldn’t cope without it, I contacted local pools to run it on spec with me as the voluntary leader since I have a teaching background and was a lifeguard…I was not unqualified. The program has grown and I became a qualified CALA instructor. We now have a one hour class five days a week with over 75 participants on my list. We run the program through the Canadian Aquafitness Leaders Alliance Inc. (CALA). Hi Charlene, I thoroughly enjoyed your recent full day of workshops in the UK! Wow, inspiring. I don't know if you remember I was talking to you about a guy in Morgan & my classes who has lost an impressive amount of weight using aqua (he was not keen on dieting). The client, Ian was taking up to 200 painkillers for arthritis and with the use of glucosomine and aqua is not only active but no longer requires medication. He is still a very heavy guy but keeps up his 5 - 6 aqua classes each week as he travels between Hampshire and Kent. but keeps up his 5 - 6 aqua classes each week as he travels between Hampshire and Kent. It is so great to see the how positive Ian has become! Aqua is awesome! "Are there any concerns about pregnant women and wearing the Aqua belts? I would imagine it would be okay to wear it above the belly and have it where it is comfortable. We haven’t really had anybody who is pregnant come to the programs so thought I should check on this and, if there any particular exercises not recommended for a pregnant lady." Kim Magnan, CALA- BCRPA Trainer, Duncan, Vancouver Island: "I saw that you were asking about wearing aqua belts during pregnancy. I attended Aquafit classes up until one week before I delivered my daughter. I was fine wearing the belt high (above my belly). I found that I was able to wear the same size belt through my entire pregnancy...the foam parts ended up being further apart as I got bigger. Some women I have talked to found the belts very uncomfortable, they said they were unstable with the belts and didn't have the core stability to hold themselves vertically in the water. Other women claim the belts make them float too much. One woman I talked to said she preferred to ride a noodle when she was pregnant and attending classes. You will find that it is really an individual thing, so make sure you give lots of options to the pregnant women in your classes and keep reminding them of options as the pregnancy progresses and their body changes." Charlene Kopansky, CALA Master Trainer, Founder and President, Toronto, Ontario: "Regarding preggies and belts... do the Specific Gravity test, if the person can remain vertical, in deep water, not touching the floor, not moving any body parts and the water is at the tips of the shoulder, they usually don't need a belt. If they sink, while doing the Specific Gravity Test, they need a flotation device of some sort. I prefer the use of a flotation belt, however it needs to be comfortable. I have noticed that most pregnant woman wear the belt just above the belly, while some wear it just below. I think it depends on how the individual is actually "carrying" and at what stage they are in their pregnancy. In most cases, I ask the preggie to assess where the belt is most comfortable and let them make a decision on their own. Also, there is the choice of using a noodle, between the legs. Again, it becomes personal choice and comfort level." Connie Jasinskas, CALA Master Trainer, Cambridge, Ontario: "Aquanatal is one of my specialties. I would prefer pregnant women ride a noodle like a horse rather than use a belt. A belt above the bump will restrict breathing and blood flow. If riding a noodle is not comfortable for the pelvic area (some people do find this), test to see whether she passes the "T" test - float vertically, with arms abducted to just below the surface of the water, legs straight down & still. If body fat is high enough, many people can float in this alignment. If she is a sinker and can't ride the noodle, I would recommend trying a belt around the hips, below the bump."